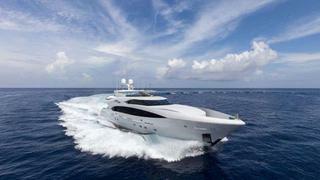 US superyacht builder Trinity Yachts has delivered the custom-designed 36.7m raised pilothouse motor yacht Finish Line. Finish Line is designed for high performance – powered by twin MTU 16V 2000 at 2,600hp each, she tops out at 23 knots. And she has an enviable range of more than 3,600 nautical miles. Her brief also called for a shallow draft of 1.7m at half load, specified to enable easy navigation in her owner's preferred cruising grounds of the US East Coast and The Bahamas. The shallow draft also allows her owner, who is a race car enthusiast, to enter the port of Daytona Beach, Florida. Her interior is by Joanne Lockhart of Yacht Next, and accommodations are found on the lower deck with a full-beam owner's stateroom – featuring a king-size berth, his-and-hers en suite and large walk-in wardrobe – and three en suite guest staterooms. There are accommodations for five crew members in five cabins. The main deck hosts an air-conditioned exterior aft deck with al fresco dining for eight and a sumptuous main saloon open to the formal dining area forward. The flybridge is well-equipped for entertaining with a full wet bar and settees for lounging and dining, and this space also houses the two Jet Skis.